Sign up and receive Property Email Alerts of Houses for sale in Benmore Gardens, Sandton. This contemporary classic masterpiece exudes luxury and life style. 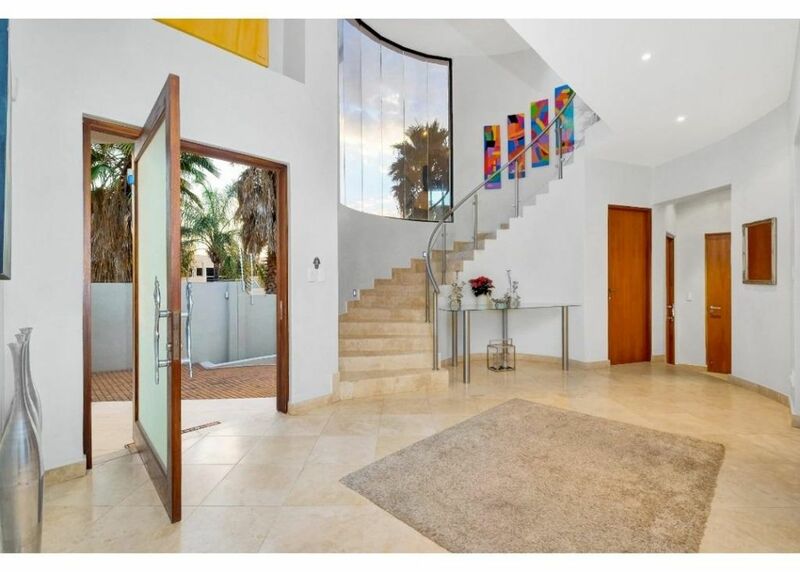 Asking Price: R14m (negotiable) - Set within the security estate of Benmore Gardens, this contemporary classic masterpiece exudes luxury and life style. The owner and the architect have considered and paid attention to every little detail to ensure absolute comfort and convenience. A generously proportioned light filled family home with seamless flow and in pristine condition. The double volume entrance hall boast a huge curved feature window which showers the entrance, staircase and landing with day light. The lounge, dining and family rooms all open through frameless stacking doors to a double entertainers patio, feature pool and manicured landscaped garden. A gourmet kitchen with scullery, integrated appliances, two double sinks and capacity for a full kosher kitchen open onto the family room and provides access to the dining room. There is a 5th en-suite bedroom or study downstairs and a guest loo. Upstairs hosts 4 beautifully fitted en-suite bedrooms. Main has large his/hers dressing rooms and opens onto a large patio. A pyjama lounge, walk in linen room and bullet proof glass security door to passage are included on this floor. The low pollen evergreen garden delights with a putting green, jungle gym, trampoline, feature lights, irrigation system and vegetable garden. Staff suite and garaging for three cars. Chandeliers, Marble, Cherry Wood, mood lighting and so much more. There are too many features to mention ..... this home is a must see! Sign-up and receive Property Email Alerts of Houses for sale in Benmore Gardens, Sandton.